Maestro solves the problem, which today affects the music industry, namely the unfair structure of the industry itself. Maestro aims to create a transparent industry through decentralization with blockchain technology. Leaving "intermediaries" from the process, consumers will be able to use streaming services at much more reasonable prices. The maestro consists mainly of two parts: "Symphony", streaming service and "Ensemble", the center of focus. Artists can raise funds for their project before production through Ensemble. After completion of the project, they can distribute their creations and earn income through Symphony. Maestro will become a new paradigm for the music industry. We at Maestro will provide an environment that allows unimpeded creation, as well as an ecosystem that fairly shares the rights of songs. Implement blockchain technology for an effective, future-oriented platform for music services. Provide an enabling environment for creating music. Maestro will solve the most pressing problem of the music industry: an unfair distribution of capital. This problem should be solved with the aim of attracting and providing a larger user base, including artists. Create an environment in which small and medium-sized manufacturing companies and new artists can reduce their financial burden and retain their rights to their work. Despite the spread of the music market, most of the proceeds continue to be monopolized by large manufacturing companies. This monopoly leads to a vicious cycle when small manufacturing companies do not have the means to create high-quality content and continue to experience great difficulties in attracting consumers. Maestro will help the creative work of small manufacturing companies and new artists through a fair distribution of the industry's capital. Help create high-quality music using Lean Process. Lean Process, which focuses on process optimization to create the greatest value from the least resources, first began in the manufacturing industry, but since its introduction it has spread widely in other areas. The music industry is no exception. Effective communication between the creator and the consumer, which begins at the production stage, helps to create high-quality content. Allow consumers freedom of choice and create new investment opportunities. Maestro will give all consumers the opportunity to invest in created, new and yet debut artists. Investors will be guaranteed a fair share of profits, even if the artists subsequently sell their rights to copyrights and distribution. Provide consumers with the opportunity to actively cooperate with artists in promoting projects and participate in the creative process. Consumers who fund projects through Maestro have an incentive to become their "marketers" and actively participate in the success of their investments. They will become reliable supporters of artists and manufacturing companies. Provide decentralized, secure services to all customers. Maestro can have service construction as its immediate goal, but in the long term, the ultimate goal of Maestro is the decentralization of services. We endeavor to eventually create a solid structure that distributes all revenue fairly among artists and token owners. 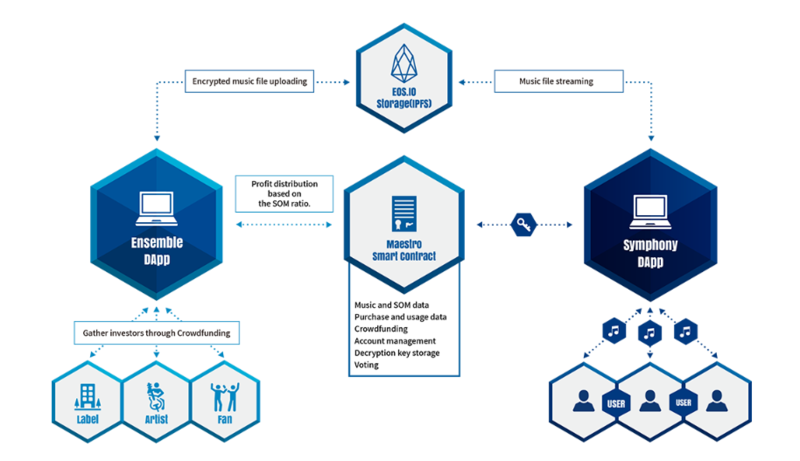 Maestro is a block-based platform that basically consists of two parts: crowdfunding services that handle the attractiveness, investment, distribution and balancing of accounts for financing, and the streaming service that handles the distribution of music. Unused tokens will be burned.